CLEVELAND — A Winter Weather Advisory remains in effect until noon Tuesday. A Wind Chill Warning kicks in at 7 p.m. and runs through 4 p.m. Thursday. There also is some ice in the area as rain Thursday has turned to ice in some places as the temperatures have dropped. Black ice and dangerously cold wind chills are expected. A Wind Chill Warning means the combination of very cold air and the wind will create dangerously low wind chill values. Frostbite can occur quickly and even hypothermia or death if precautions are not taken. A Winter Weather Advisory for snow means periods of snow will cause primarily travel difficulties. Expect snow covered roads and limited visibilities, and use caution while driving. The latest road conditions can be obtained from the Department of Transportation web site. Arctic air is moving into the area today and will remain through Thursday. Low temperatures Wednesday and Thursday morning will be the lowest the region has felt since February 2015 and could break daily records by several degrees. 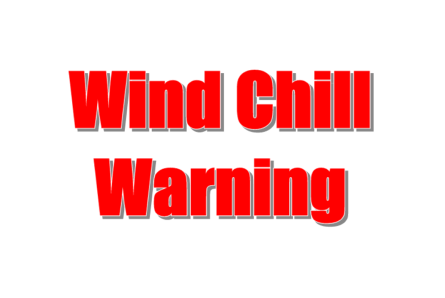 Through this period, winds 10 to 25 mph across the area with gusts to 30 mph will produce wind chills values of 25 to 35 degrees below zero, and 40 degrees below zero is possible in some locations of northwest Ohio. This will cause life threatening cold conditions.